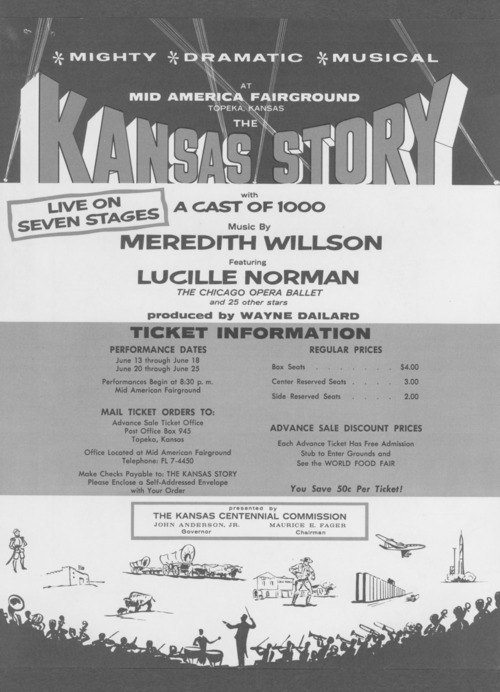 This flyer for purchasing tickets is promoting the musical "The Kansas Story" at the Mid America Fairgrounds in Topeka, Kansas. It was a historical pageant covering most of Kansas history. The performance was written and directed by Vladimir Rosing and produced by Wayne Dailard, with music by Meredith Willson and Frank Allen Hubbell. It had a cast of 1000 and the show was performed on seven stages. It featured Lucille Norman of the Chicago Opera Ballet. The musical was part of the celebration of the Kansas Centennial.